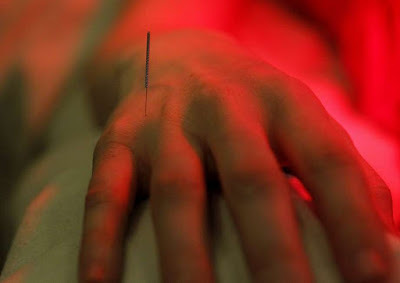 Off I went to see an acupuncturist. I was a little skeptical, but the practice of acupuncture had been around for more than 2,000 years. It must have worked for someone. Now, that’s confidence! I had been a little skeptical, but no more. This woman said it with such assurance that it left me no doubt I would be cured once and for all. “Anything else bothering you?” she asked before beginning the treatment. I couldn’t think of a third ailment, so I made one up. She said she could help. Then the treatment began. I felt a sharp prick when she inserted the needle, but I didn’t feel the sedation. But she immediately began inserting needles everywhere, sedation or not. It didn’t really hurt much, so maybe the sedation was indeed working. Within minutes, I had needles in my knee, my wrist, my shoulder and for some reason, my head. Then she left, leaving me in the room for 45 minutes to let the needles do their work. When she returned, she quickly removed the needles and asked how I felt. I now had no needles in me, so the answer was obvious. “Better,” I said. As noted, acupuncture works for many ailments and many people, but not in this case. I tried two more sessions and showed no improvement. I then saw a physical therapist, who suggested (surprise!) rest. Since my son will soon be an acupuncturist (by next summer, I'm told), I naturally paid attention to this less than encouraging story. Neither should politicians, for that matter! Acupuncture isn't medicine and doesn't work.